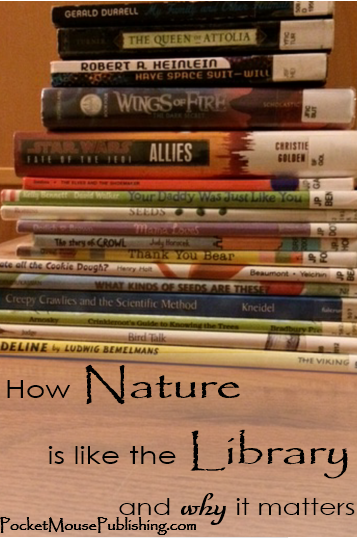 Nature – the great outdoors – is a lot like the public library. Nature is space free for all to visit, all to peruse, all to enjoy – paid for by tax dollars, public & private benefactors, and citizen fundraising; maintained by forest rangers and naturalists (the librarians of their wild spaces) and the enthusiasm of volunteers. We go to the library to learn: a vast collection of non-fiction books on every topic imaginable, waiting to be read and gleaned from. There is always something new to be found on a library shelf. 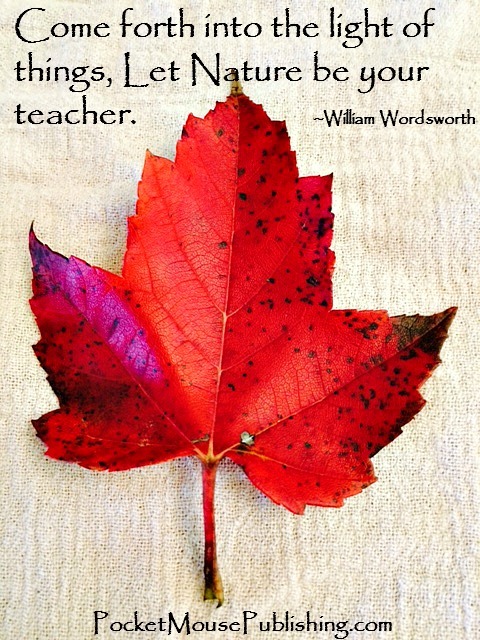 We can go to nature to learn as well. Every walk in the woods will reveal something new. We go to the library for enjoyment: genre upon genre of fiction, poetry, picture books, movies, comics, how-to books. We can go out in nature for enjoyment too. 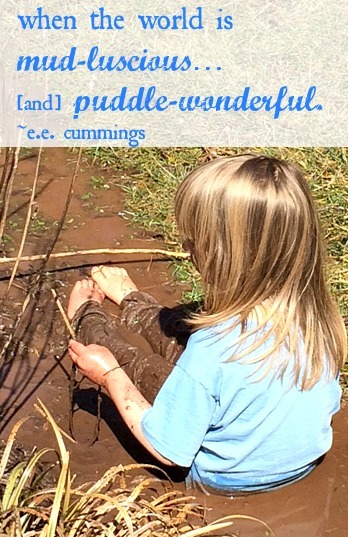 A mud-puddle and a mountain are always ready to provide a new experience. Just as our minds long for ideas that we can find in a book at the library, so our hearts and eyes long for nature – photos of breath-takingly beautiful nature scenes abound on Pinterest, are shared on Instagram, and hang on the walls of homes & offices around the world. Yet, unlike the library – still a place of generally hushed reverence (except during toddler story time! ), nature is often carelessly used as a dumping ground – tires, empty cans, golf balls, and a large collection of half-filled plastic water bottles litter the creek near my home. Would you ever find these in your local library? Who keeps the library clean? Who keeps the natural spaces around your home clean? If we all treated nature more like the library, I think the world would be a better place. We borrow. We return. We pay our fines when owed. We preserve. We respect. We enjoy! May you find yourself out in nature or in a library today — better yet, both! Thank you! The more I think about it, the better an analogy it seems — I know I’ve heard the idea that we borrow the earth from future generations, just like we borrow books! I’m learning to love the mud…or rather cheerfully tolerated it! I do love beautiful quotes! Did you know it’s National Library Week this week – just in time for that! And Earth day is next week, we could wrap them into one this week to bridge them together! I love this post, so much that I think I may reblog it! I did not know it was National Library Week! I went yesterday to the library and sure enough, they had a big sign. I LOVE the library! Me too! So much so that I joined the board of our local one. And nature and libraries are a bit alike, that was a great connection you made! Here’s a wonderfully fun thought from Pocket Mouse Publishing’s Lee, just in time for National Library Week, and Earth Day soon to come. Make sure to add a little nature and library to your life and enjoy them both. Love the way you draw the connection! Both are filled with wonderful potential, no matter where you look you can enjoy and learn something new. And no matter how comfortable you are in a section/woodlands, there will always be new stories to experience. Well said. Such a thoughtful post. Thank-you!!!!! This is so cool! What a great thought! I would love if you would enter this in the Nature Chills Challenge on my blog too?